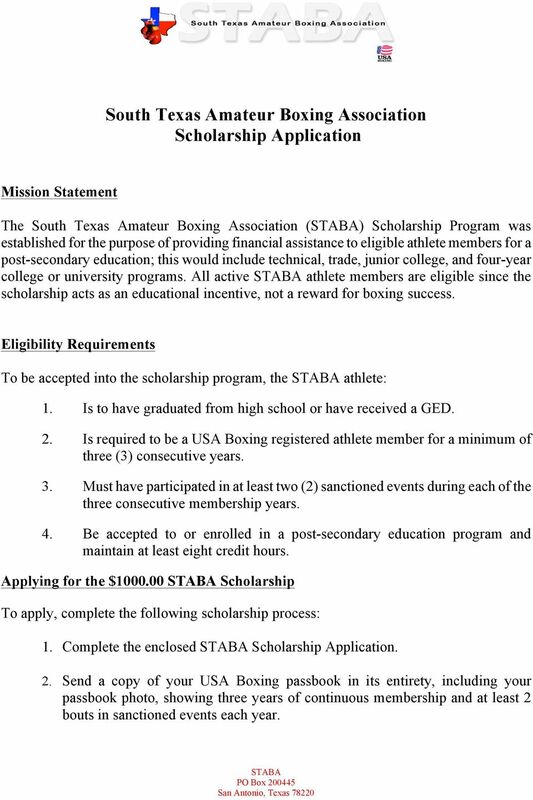 Download "South Texas Amateur Boxing Association Scholarship Application"
1 South Texas Amateur Boxing Association Scholarship Application Mission Statement The South Texas Amateur Boxing Association () Scholarship Program was established for the purpose of providing financial assistance to eligible athlete members for a post-secondary education; this would include technical, trade, junior college, and four-year college or university programs. All active athlete members are eligible since the scholarship acts as an educational incentive, not a reward for boxing success. Eligibility Requirements To be accepted into the scholarship program, the athlete: 1. Is to have graduated from high school or have received a GED. 2. 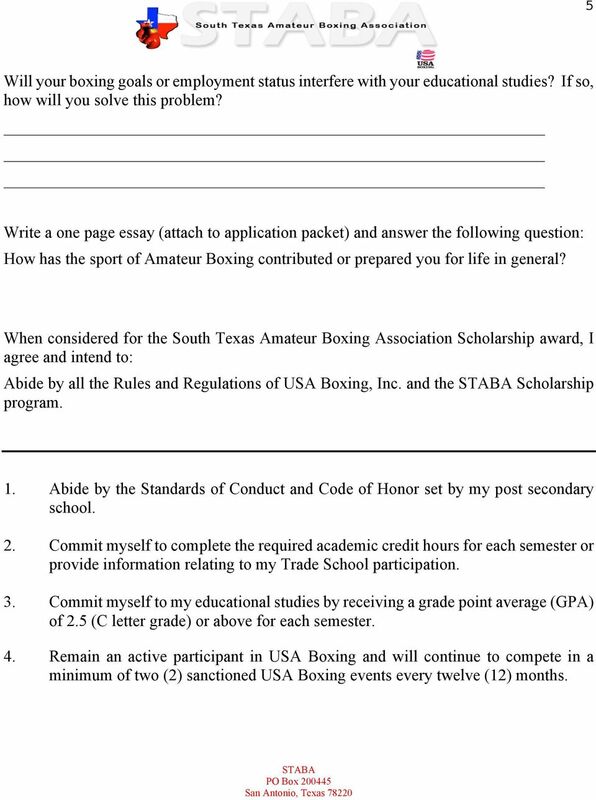 Is required to be a USA Boxing registered athlete member for a minimum of three (3) consecutive years. 3. Must have participated in at least two (2) sanctioned events during each of the three consecutive membership years. 4. Be accepted to or enrolled in a post-secondary education program and maintain at least eight credit hours. 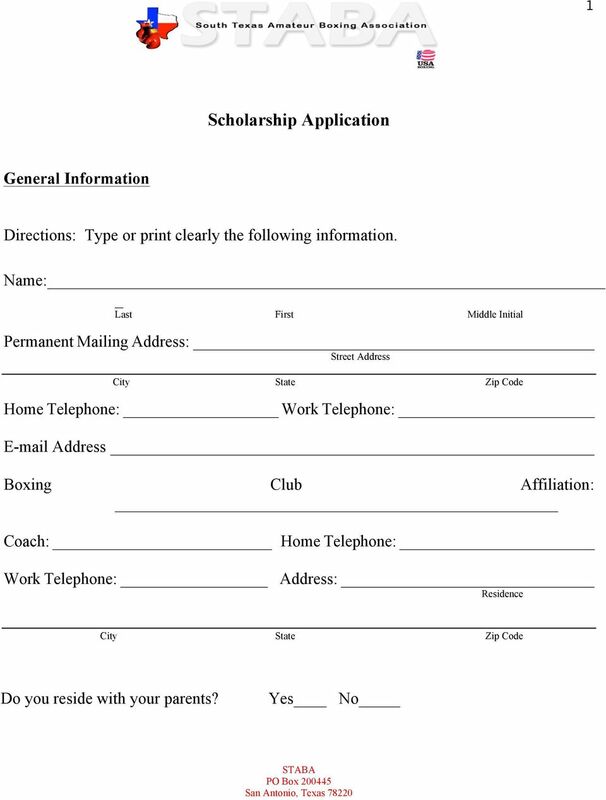 Applying for the $ Scholarship To apply, complete the following scholarship process: 1. Complete the enclosed Scholarship Application. 2. Send a copy of your USA Boxing passbook in its entirety, including your passbook photo, showing three years of continuous membership and at least 2 bouts in sanctioned events each year. 2 3. An original high school transcript, including grades 10, 11, and 12, and your post high school transcript. An official copy is requested, but is not mandatory. (A student copy is acceptable; have the school place its seal and date on your transcript.) 4. A copy of your letter of acceptance to the institution you plan to attend. Junior level students are to provide a copy of their letter of acceptance from the college. 5. 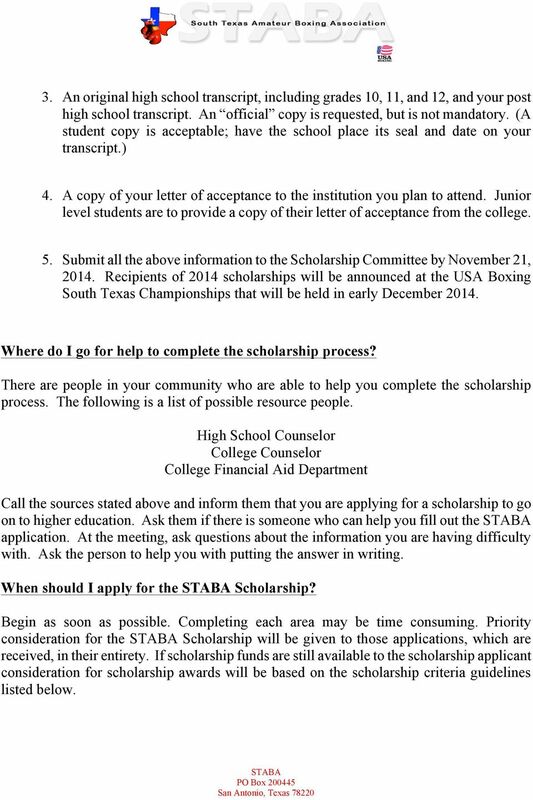 Submit all the above information to the Scholarship Committee by November 21, Recipients of 2014 scholarships will be announced at the USA Boxing South Texas Championships that will be held in early December Where do I go for help to complete the scholarship process? There are people in your community who are able to help you complete the scholarship process. The following is a list of possible resource people. High School Counselor College Counselor College Financial Aid Department Call the sources stated above and inform them that you are applying for a scholarship to go on to higher education. Ask them if there is someone who can help you fill out the application. At the meeting, ask questions about the information you are having difficulty with. Ask the person to help you with putting the answer in writing. When should I apply for the Scholarship? Begin as soon as possible. Completing each area may be time consuming. Priority consideration for the Scholarship will be given to those applications, which are received, in their entirety. 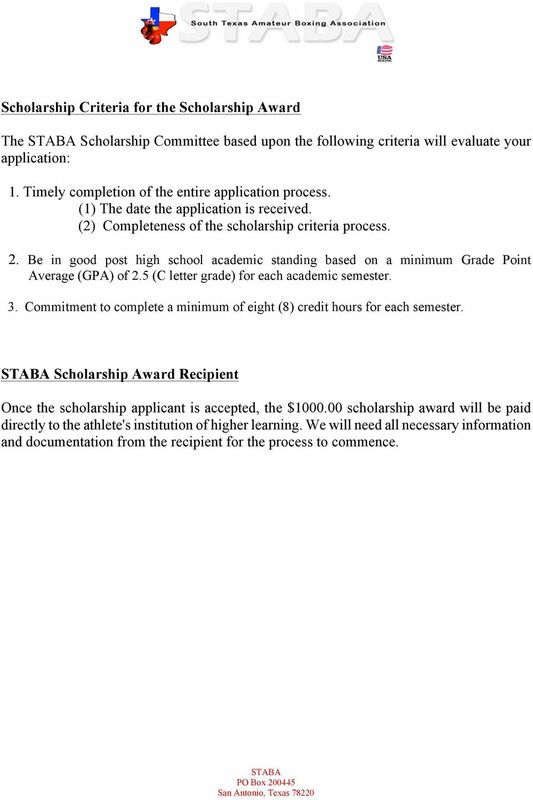 If scholarship funds are still available to the scholarship applicant consideration for scholarship awards will be based on the scholarship criteria guidelines listed below. 3 Scholarship Criteria for the Scholarship Award The Scholarship Committee based upon the following criteria will evaluate your application: 1. Timely completion of the entire application process. (1) The date the application is received. (2) Completeness of the scholarship criteria process. 2. Be in good post high school academic standing based on a minimum Grade Point Average (GPA) of 2.5 (C letter grade) for each academic semester. 3. Commitment to complete a minimum of eight (8) credit hours for each semester. Scholarship Award Recipient Once the scholarship applicant is accepted, the $ scholarship award will be paid directly to the athlete's institution of higher learning. We will need all necessary information and documentation from the recipient for the process to commence. 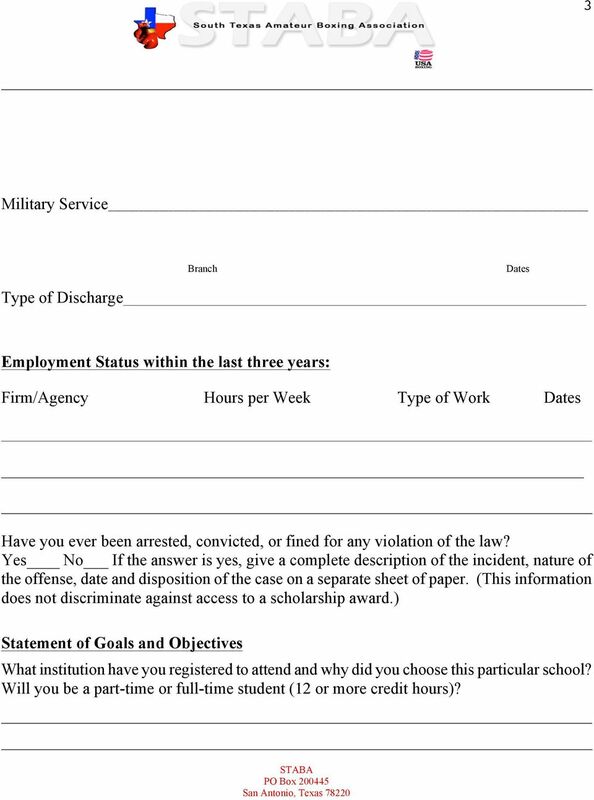 6 3 Military Service Branch Dates Type of Discharge Employment Status within the last three years: Firm/Agency Hours per Week Type of Work Dates Have you ever been arrested, convicted, or fined for any violation of the law? Yes No If the answer is yes, give a complete description of the incident, nature of the offense, date and disposition of the case on a separate sheet of paper. (This information does not discriminate against access to a scholarship award.) Statement of Goals and Objectives What institution have you registered to attend and why did you choose this particular school? Will you be a part-time or full-time student (12 or more credit hours)? 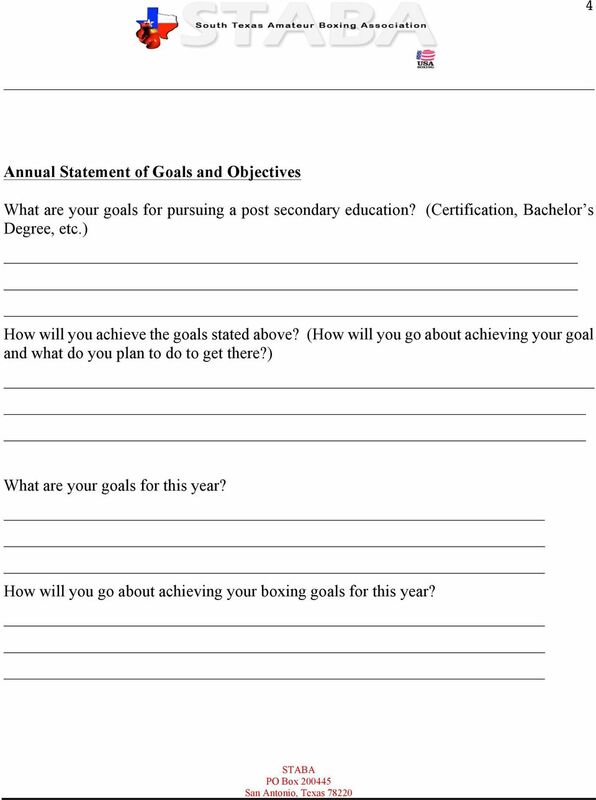 7 4 Annual Statement of Goals and Objectives What are your goals for pursuing a post secondary education? (Certification, Bachelor s Degree, etc.) How will you achieve the goals stated above? (How will you go about achieving your goal and what do you plan to do to get there?) What are your goals for this year? How will you go about achieving your boxing goals for this year? 8 5 Will your boxing goals or employment status interfere with your educational studies? If so, how will you solve this problem? Write a one page essay (attach to application packet) and answer the following question: How has the sport of Amateur Boxing contributed or prepared you for life in general? 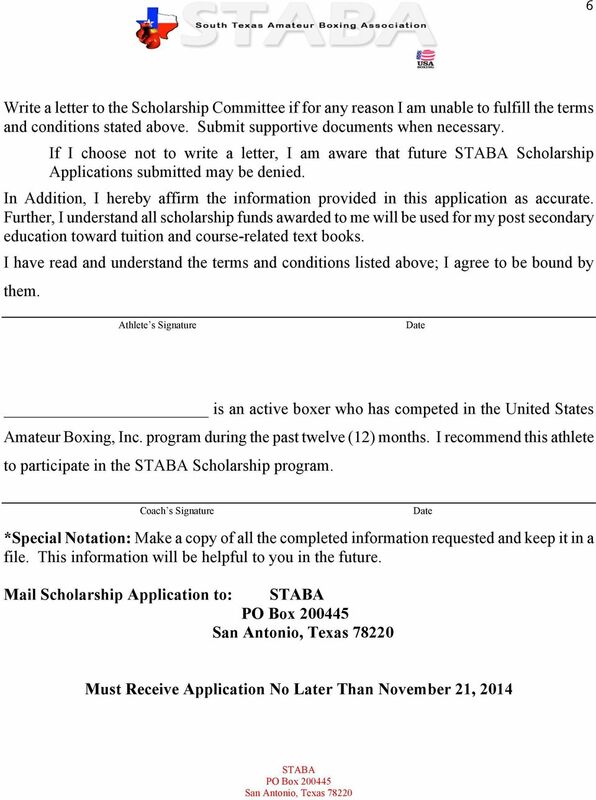 When considered for the South Texas Amateur Boxing Association Scholarship award, I agree and intend to: Abide by all the Rules and Regulations of USA Boxing, Inc. and the Scholarship program. 1. Abide by the Standards of Conduct and Code of Honor set by my post secondary school. 2. Commit myself to complete the required academic credit hours for each semester or provide information relating to my Trade School participation. 3. Commit myself to my educational studies by receiving a grade point average (GPA) of 2.5 (C letter grade) or above for each semester. 4. Remain an active participant in USA Boxing and will continue to compete in a minimum of two (2) sanctioned USA Boxing events every twelve (12) months. DAV AUXILIARY ONSLOW COUNTY UNIT 16 EDUCATION SCHOLARSHIP FUND INFORMATION & RULES The Onslow County Unit of the DAV Auxiliary desires to award scholarships from the Unit Educational Scholarship Fund. For more information or to request an application for the Virginia B. Johnson Nursing Scholarship, please call RMC Foundation at 803-395-2231.
. The scholarship was established in honor of Virginia Blount Johnson, a registered nurse and beloved community leader and healthcare advocate, who left her indelible mark on the Orangeburg community. INSTRUCTIONS. 1. 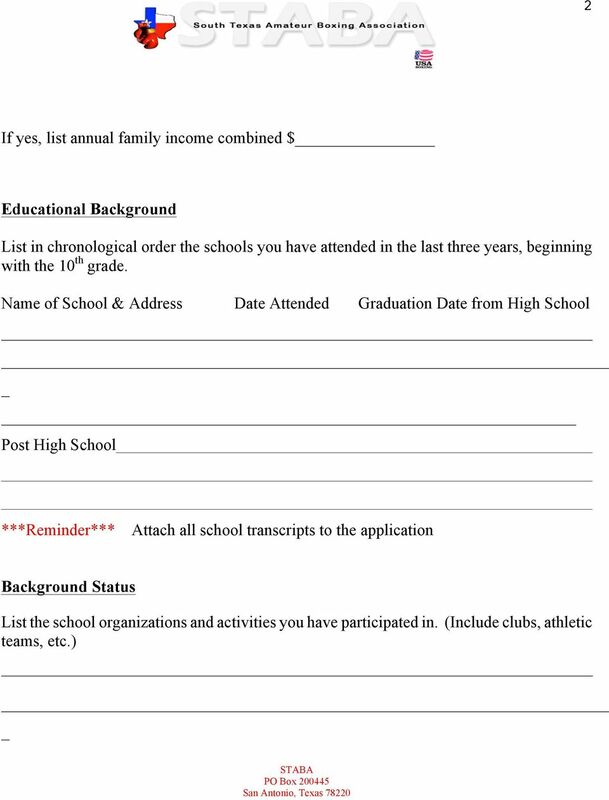 Complete all of the applicable forms in the application package. All forms must be typed.